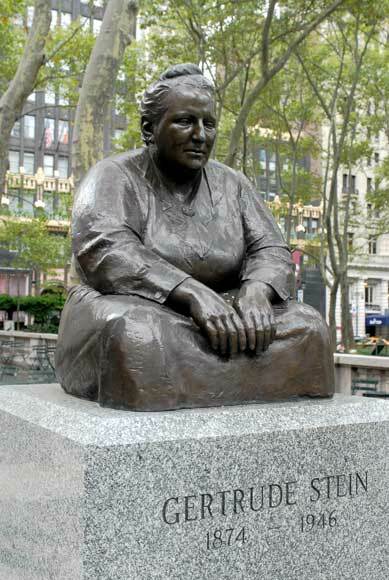 At this time of year, the life-sized bronze Gertrude Stein statue is somewhat buried behind The Holiday Shops in Bryant Park. She is one of ten made from a cast by friend and sculptor Jo Davidson in Paris, in 1922, and possibly the only one displayed outdoors year-round. Davidson had a long list of commissioned busts, including Charlie Chaplin, Hellen Keller, and Frank Sinatra. Many of them can be seen here. 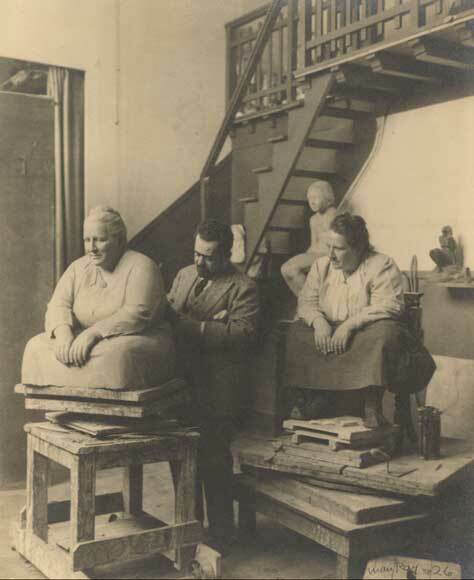 The photo below, taken by friend and surrealist photographer Man Ray, shows Davidson working in his Paris studio, with his subject Gertrude Stein looking on. Stein was connected to the ex-pat art and literary scene of the times, coining the term "lost generation," later used by Hemingway to refer to that generation of authors: "You are all a lost generation," epigraph, The Sun Also Rises. Though most well-known for her writing and personal relationships, Stein, along with several members of her family, amassed an impressive art collection, on display at the Grand Palais now until mid-January.Time to use up those miles! The Bryant Park statue was donated by Dr. Maury Leibovitz, psychologist and art dealer, and unveiled in a small ceremony on November 5, 1992. In addition to the sculpture, Mr. Leibovitz owned an estate formerly belonging to Jo Davidson. Davidson has another Bryant Park connection -- for a time, he worked out of a studio at the Bryant Park Studios, on the corner of 40th Street and Sixth Avenue. So it's fitting that she found a home in the park. As for the other nine statues, I tracked down a few of them: one at The Met (they also have a beautiful Picasso portrait of her), supposedly one each at The Whitney and The Carnegie Museum of Art, and possibly one at The Smithsonian (it was on view last Spring, but could have been on loan). **The Parks Department has a monuments catalog available online. You can read about most every statue you've ever seen in the park system until your eyes bleed. **Now you can settle all of those arguments about when the Post Modern ends and Contemporary begins with this handy chart.